The Mining History Association holds an annual conference in a historic mining area. Attendees typically come from across the USA and from several foreign countries. Many extend their trip to visit other scenic, historic, and recreational areas. Each meeting includes program sessions with presentations on a variety of mining history-related topics. Field trips and tours are taken of historic and active mining operations. Social events at the meetings include a Welcoming Reception, President’s Luncheon, and Awards Banquet. There is plenty of time for attendees to get or stay acquainted, compare notes, and share their own interests in mining history. Use the drop-down menu list on the Meetings tab above to learn more about our recent annual conferences and field trips. Web pages for additional conferences are being added. Check back often to see what’s new. 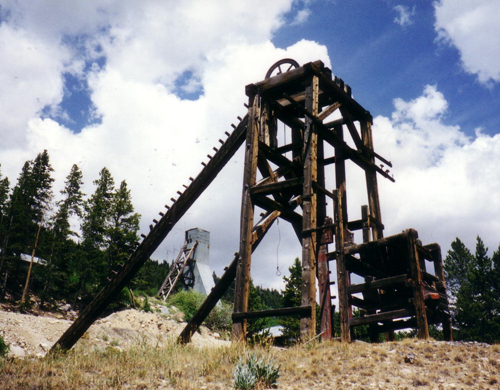 Historic First National Mine headframe in the foreground with the modern Black Cloud Mine in the rear Leadville, CO.